Buy the program here and get started now! Please select the shipping information below and then CLICK the "Buy Now" button to proceed with the registration process. The cost for the program is $455, plus $15.95 shipping in the U.S. or $42.95 shipping to Canada. The registration fee of $455.00 is for ONE new player and includes a ball kit, which will be shipped to the address you provide during the registration process. ***Again, this $455 registration fee is for ONE player (NOT a TEAM) and is NON-REFUNDED under the premise of that misunderstanding. Once the registration application is received and processed, a registration email (containing your AUTHORIZATION CODE) with testing and submission instructions, as well as a link to the instructional videos, will be sent to the email address you provided when registering. Please allow up to 24 hours for processing. ***NEW Referral Program - Receive a $50 CHECK for each player you refer! Simply have the player registering enter your AUTHORIZATION CODE in the "Referred by Auth Code" box above and we'll cut you a $50 check. Offer available to any and all current and former participants who possess a valid authorization code. There are NO LIMITS on the number of referred players you can be compensated for. To be compensated for a referred player the referred player MUST enter your authorization code in the designated box above and MUST register on THIS webpage (www.velocityplusarmcare.com/buy/), registration(s) from any other website or in any other manor will not be eligible for referral compensation. 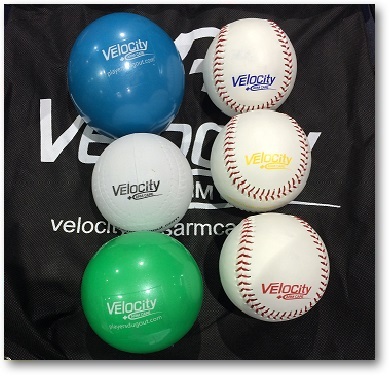 ***Again, this package includes ONE velocity BALL KIT ONLY (quantity can be changed once in cart), instructions for use are NOT included and is NON-REFUNDED under the premise of that misunderstanding. ***Again, this $699 bundle includes registration for ONE player (NOT a TEAM) and is NON-REFUNDED under the premise of that misunderstanding. The NEW Pocket Radar Ball Coach. 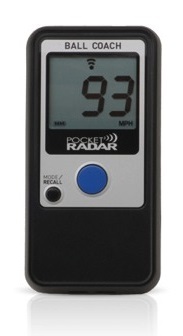 After thousands of Velocity evaluations this is the first consumer grade radar we have found to accurately and consistently capture both 2lb and 2oz velocities. After hundreds of side-by-side tests along side professional grade Jugs and Stalker radar guns the Ball coach has proven extremely accurate. Whether evaluating a 9 year old, or 19 year old, we are confident that the Ball Coach won't disappoint. Guaranteed to accurately collect 2lb and 2oz velocities!